Ive always enjoyed making stuff. However, I only really felt like I discovered my own sense of creativity having left college and travelled to the chaos of India. It was there that I started painting on a grand scale, and where I had my formative experiences with a sub-culture, namely, the acid party scene. Together with a small group of friends, I formed a successful artists co-op called ZAG, which provided decor at clubs and parties throughout Europe in the early 90s. In ’97 I started tattooing in Brighton, immersing myself in a folk-art that has its ancient roots in worldwide culture. And I was lucky; in 2003 I was invited to open a studio with tattoo legend, Alex Binnie. We had a great 13 years at Into You Brighton, also known as 1770 Tattoo, becoming the best custom tattoo shop in the South, and having a lot of fun on the way. During this time, I was fortunate to attend a chairmaking course with Paul Hayden at Westonbirt Arboretum… I became hooked. I built a workshop in 2014, and started making chairs by private commission. In 2017 I decided to pack my tattoo machines away, get into my workshop, and try to forge a new direction with my woodwork. My chairs are built wholly within a tradition, yet, I hope, embody both my creative history and my artistic vision. 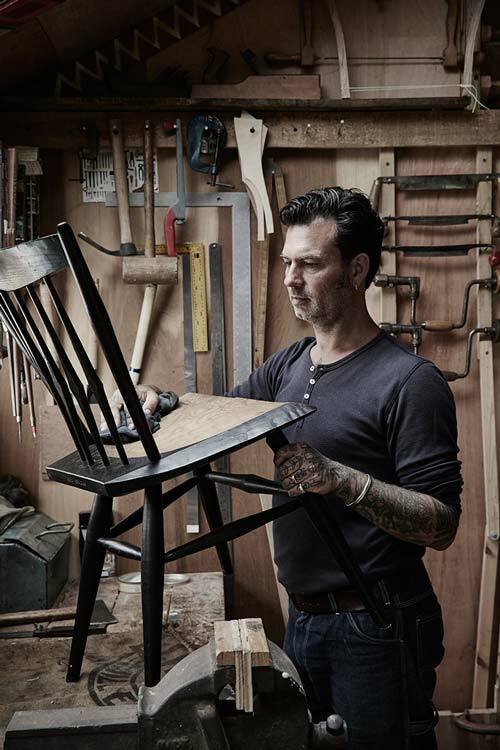 The glossary of chairmaking tools reflects the individuality of the craft: the froe, gutter adze, travisher, scorp, spoon bit, drawknife and snake coffin, to name but a few. Each chair is a journey, one that often starts with me spending a day in the woods, selecting freshly felled, quality logs of ash, oak, beech, or cherry. These are then split to size using wedges and then fashioned into the components of the chair. 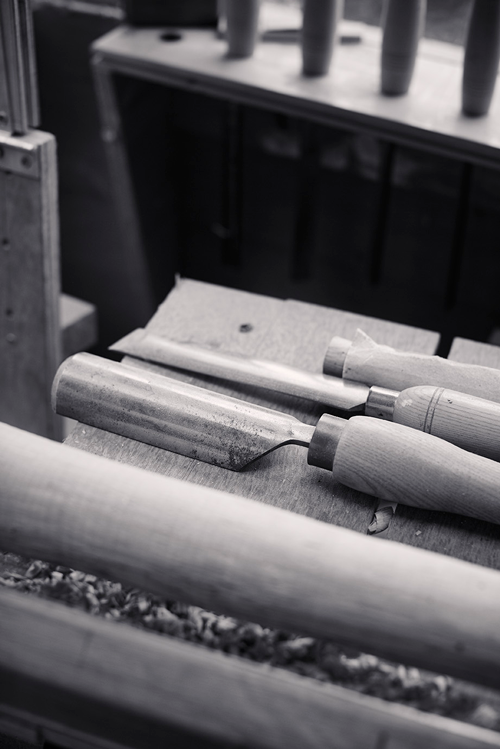 Legs, stretchers & posts are turned on a pole lathe….arms, spindles and crests are shaved to size. Bent parts are created by steaming, and then clamping pieces to forms, and leaving them to set. The most fun part of the process is carving the seat. The shape is cut from a single seasoned board; elm, oak, ash or chestnut. I like my seats to be strongly sculptural, generous, and deeply carved. The chair is carefully assembled, with an emphasis on comfort and strength. I like to finish my chairs with a dark ‘milk paint’ that contrasts well with the woods natural grain; this lends the the chair a modern flavour and a strong silhouette. My chairs are an attractive addition to both contemporary and traditional spaces.